The zebra moray eel can live in extreme underwater regions of the tropical and temperate Indian and Pacific oceans. They stay around crevices and ledges of reefs and can swim to depths of 130 feet (39.6 m). These eels eat fish, crustaceans, worms and other scavenged food. At the zoo, we feed the eels capelin (a small fish), krill and squid. The zebra moray eel has a tube-like, elongated deep brown body with light yellow to white “zebra” stripes. The eel’s large mouth has backward curving, sharp teeth. Like a snake, the zebra moray eel slithers around coral reefs with its long ribbon-like body. Hugging the top and bottom of the body, short wavy fins help propel this moray. Unlike most other fish, moray eels don’t have scales, so to protect themselves against scrapes and parasites, they ooze a slimy coating of mucus over their thick muscular bodies. This eel is unpredictable and at times can be very aggressive. It has powerful jaws that can cause a serious bite if agitated. At night, the zebra moray lurks in underwater crevices waiting for prey. When hunting, the zebra moray will nose at its prey with its snout before it attacks. If its prey is small, this moray will chow down on the entire creature at once. With larger prey, the zebra moray will pick off the legs and claws, eat them, and then eat the body. Once the moray has a good grip, the prey cannot escape. The moray’s teeth face backwards on an angle, pointing toward the throat. This creates a trap that makes it all but impossible for prey to wriggle free. Even their breathing looks scary! At rest, a moray breathes through its mouth, flashing a set of numerous teeth. This may make them look mean, but they’re actually breathing—flushing water over their gills. They attack only when hungry or provoked. Zebra moray eels breed in the spring and summer months, laying free-floating eggs which are fertilized externally. Reproduction in moray eels begins with a courtship ritual in the summer months when the water is warmest. Opening their mouths very wide at each other signals the start of this process. 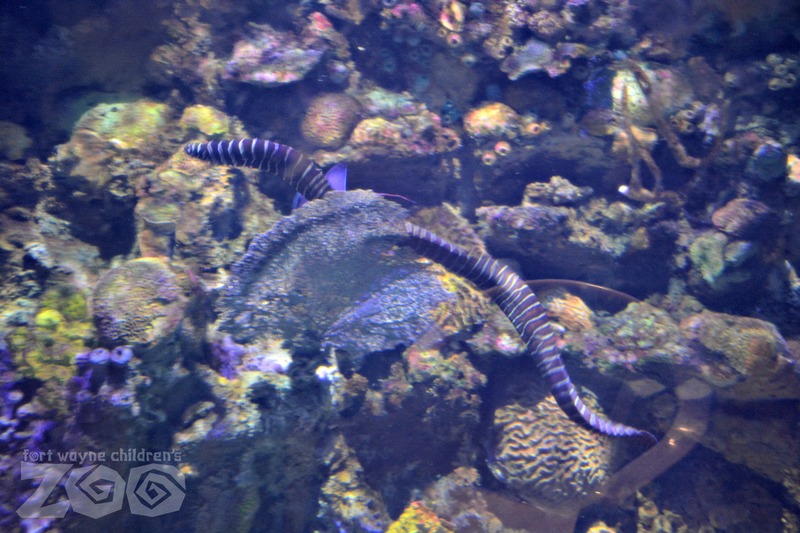 Morays will then wrap their bodies around each other for hours. Once the female lays her eggs and the male fertilizes them, the pair leaves one another. Once hatching from the eggs, the young moray eels are shaped like small leaves. They can be about three inches long, very thin, and almost transparent or clear. The larvae float out in the open ocean near the surface for over eight months and when they grow large enough to defend themselves, they swim down and join the other creatures on the reef.